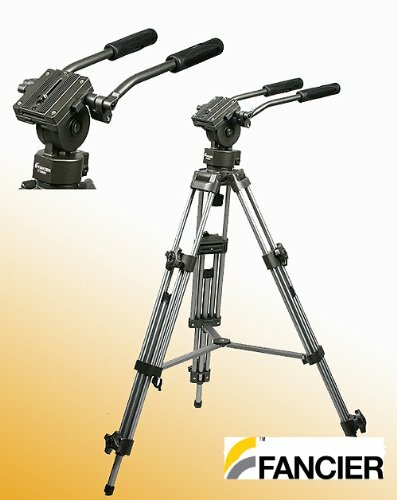 The Fancier AVTP is a complete Professional 75mm Video Tripod including legs, mid-level spreader, dual fluid head and carry bag. The legs are a 3-Segment Interlocking Crutch-Type design with a mid-level spreader providing oustanding stability for Video Cameras up to 27lbs. The legs utilize large ergonomic lock adjustment knobs and rubber feet for stability. 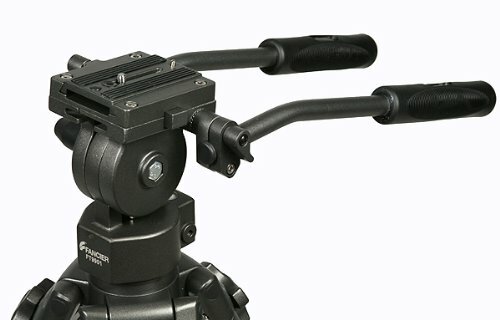 Interchangeable heads connect to the legs using a standard 75mm bowl with a separate lock adjustment providing pan and tilt adjustment in addition to the head. The head features dual continuous drag fluid movement for both 360 degree pan and 180 degree tilt as well as dual handles for more precise control. There are independent locks for both the the pan and tilt axis. The camera secures to the head using a quick release video plate with a separate safety latch to prevent slideoff. The carry bag is large enough to hold the legs, head and spreader and is included for your convenience. The black double-stage aluminum alloy tripod offers great strength and stability.